Ovo-ovO is a furniture object inspired by palindromic principles. A palindrome is a word, sentence or sequence, that can be read both backwards and forwards. Ovo-Ovo is in sandcast aluminum. It has a roughly sanded surface and a matte waxed finish. Height: 45 cm. With one side up, it serves as a stool or sidetable. With the other side up, it can be used as a vessel; a floor vase + bowl. While the functions of the object, become secondary, in relation to form, so does the meaning of the name: Ovo-ovO. Since the letters are chosen for their graphic, that mimics the shape of the object. Like the formal language of the object, the name is also a palindrome. These images of Ovo-ovO, is shot in the cellar vault below Sostrup Castle & Monastery (sostrup.org). 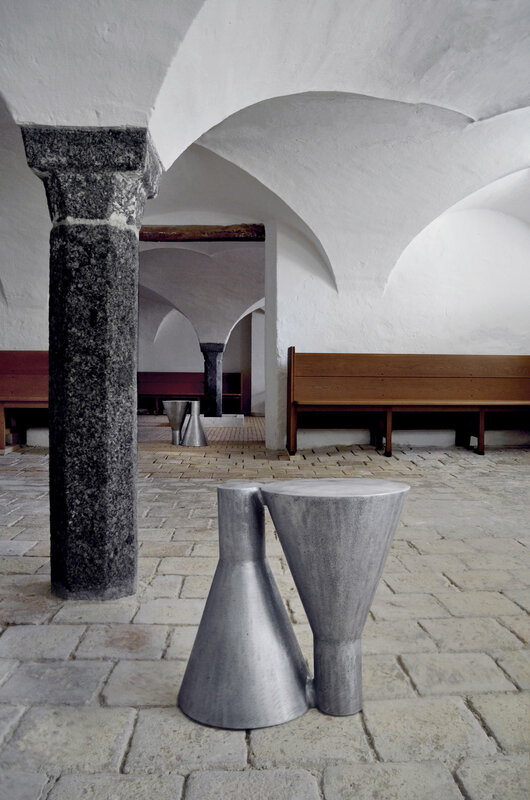 Sostrup Castle & Monastery is now a refugium and cultural venue with focus on contemplation, art and music. The place is open to all religions and philosophies.